One of the key benefits of using genuine stone over faux, prefabricated material lies in the sheer, organic beauty of its natural appearance. Another advantage that natural rock has over the artificial version is the level of customization that’s possible. You can decide the size, height, and type of natural material that fits your style preference, overall pool design, and project budget. An experienced pool builder can comfortably guide you over the “rocky path” (forgive the pun) to tailoring a design that enhances your pool and outdoor setting. A sleek aesthetic comes together with organic style in this stone design. This project illustrates how you can combine natural shapes with a smooth, tiled façade for a distinctive look. 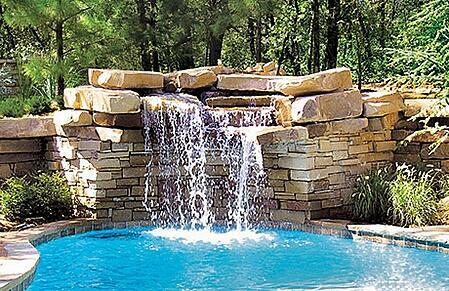 A natural rock waterfall allows water to flow from a raised, decorative structure down into your swimming pool. 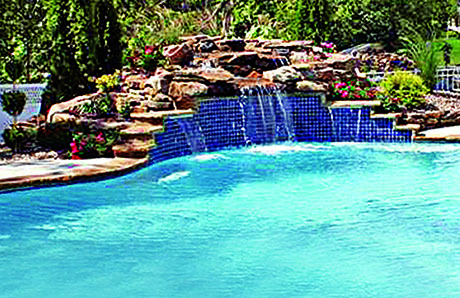 Lagoon- or tropical-themed pools are the most common category of pool style for incorporating these decorative features. 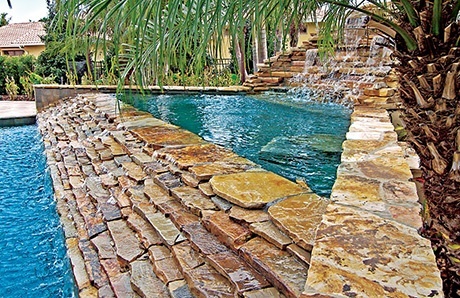 These organic-style stone creations are not always the best fit for sleek, modern pools. However, for some contemporary pool settings, waterfall designs using straight-cut stones and quasi-geometric configuration can mesh well. This poolscape marries geometric angles with a massive stone structure, demonstrating how a natural-style rockfall configuration can complement a contemporary pool shape. The project also provides an excellent example of how a sloping yard can provide the foundation for a breathtaking waterfall. When it comes to the geological choices for your new waterfall, pool builders or masonry specialists will consider factors ranging from your preferences for waterfall shape and configuration to the style of your landscape plans. Typically, masons will use a mix of various sizes and shapes of the rocks, incorporating both large and small stones, as well as rounded and straight ones. However, some designs—particularly those trying to achieve a more contemporary look—might use stones that have been cut to be more consistent in both size and shape. Here, a stacked-stone creation with Tennessee Crab Orchard flagstone flows first into a shallow play pool. The extra water volume in the play pool then pours out over a spillway into the main pool below. Choices for the basic building blocks of waterfalls vary by region of the U.S. The range of options include granite, quartzite, millsap, firestone, flagstone, fieldstone, limestone, moss rock, lava stone, and Oklahoma stone. Masons modeled this swath of rock work on a creek bed that the clients wanted to resemble the landscape at their log cabin vacation home. The sprawling configuration begins approximately 40 feet beyond the pool edge, and it consists of various sizes of granite, sandstone, and limestone boulders. It’s worth noting that the availability of certain kinds of rocks varies on geographic availability and local rock quarries. Indigenous rocks from a local supplier will typically be your best choice. They will cost less than rocks that must be shipped in from across the country. 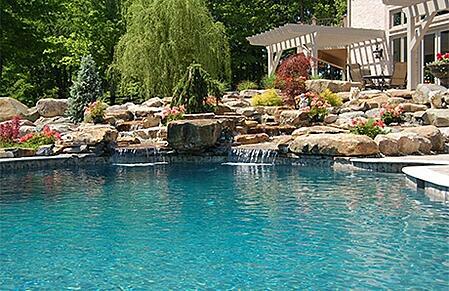 When it comes to positioning your rock waterfall around your pool, location matters. 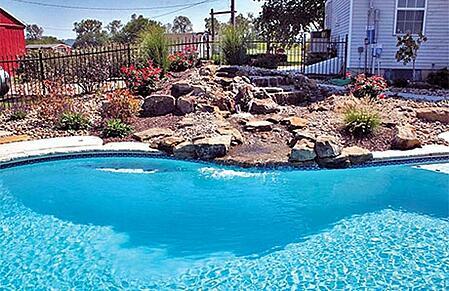 The ideal spot in your backyard is a higher elevation than the pool. That creates a more natural effect, given that gravity causes water to flow downhill. 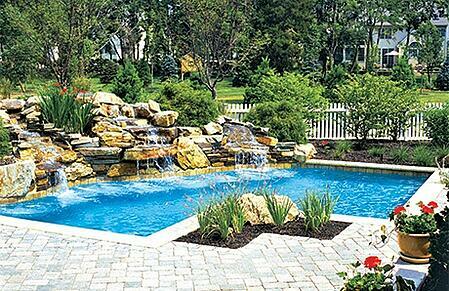 However, waterfalls can also work extremely well in flat yards, giving them greater visual dimension. Water glistens in the sunlight as it cascades down this simple, 3-foot-tall by 6-foot-wide rock waterfall. Composed of moss rock boulders, this project features three tiers and shows how waterfalls can give dimension to otherwise-flat backyards. If your backyard has a slope, and if it fits with your overall pool design plan, you can save time and excavation costs by integrating the waterfall into the pre-existing elevation. Some of the most striking results come from using this approach. The descending slope in this backyard serves as the foundation for this waterfall, which is the visual centerpiece of a curvy, free-form pool. The straight-cut stone slabs are native to the region, and their arrangement evokes the image of a mountain stream cascading onto a pond below. 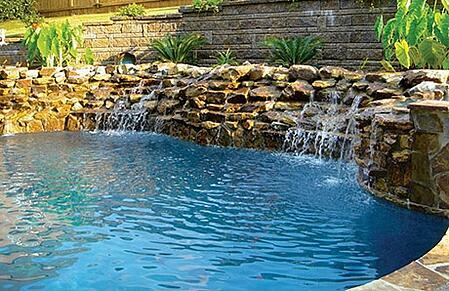 Your imagination can run free with the layout of your rock waterfall. Go for the look of a babbling brook, imitate a canyon wash effect, or create a sheer, cliff-style water drop-off. For greater liquid drama, ask your designer about a towering, multi-tier creation that takes center stage in your poolscape, or consider a multi-fall configuration with two, three, or even more separate falls. Rising about four feet above the pool surface, this waterfall was built with weathered firestone boulders, as well as sheets of flagstone. The mason used a single, extra-wide piece of flagstone to create a sharp, overhanging ledge that generates a cascade-style fall. Add some plants with your rock waterfall to integrate it with your landscaping. When planning the design, a builder can create what is known as landscape pockets. Plants can grow in these small niches in several spots throughout the waterfall configuration. Expert tip: Succulents and drought-tolerant plants such as sedums, junipers, and cotoneasters are good picks; they can grow on slopes and need less watering. 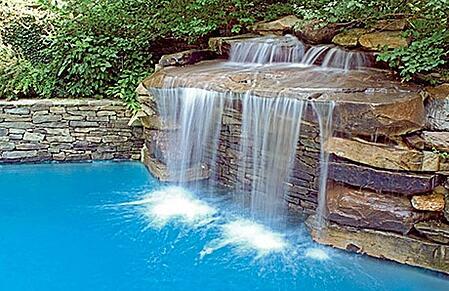 One note: Many pool builders are hesitant to add natural rock waterfalls to pools with salt water sanitizing systems. The reason: Most natural stone is porous, and over time, salt water tends to invade the stone and erode the material. While it’s possible to cover rocks with a coat of sealer to keep out the corrosive salt water, it may affect the stone’s natural appearance, and you will need to regularly re-seal the rocks to maintain the protective barrier. This highly organic-style waterfall resembles boulder configurations seen in nature. This design is coupled with a free-form pool that’s flanked by native foliage; together they form a poolscape that brings to mind the feeling of a countryside pond or stream. Accent rocks or boulders that are separate from the waterfall are also great options. They provide a simple way to extend the visual rock waterfall theme and more thoroughly integrate the waterfall into the overall pool design. This approach involves one or several small—roughly 18-inch to 24-inch-tall—boulders of the same kind used in the waterfall. The stones are strategically placed at several spots along your pool perimeter, such as corners, or to visually mark a beach entry. 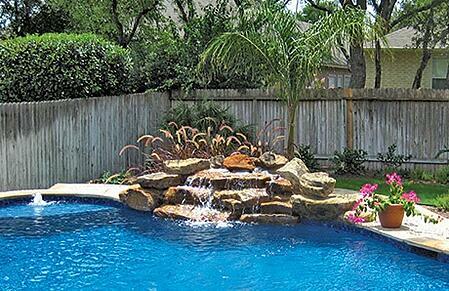 Expert tip: Planning a deep diving pool and diving board or your new backyard resort? Some homeowners choose to forgo the traditional—and somewhat unattractive—diving board and instead include a diving rock (aka jump rock) for a more organic, aesthetically pleasing look that continues the rock theme to another spot around your pool. 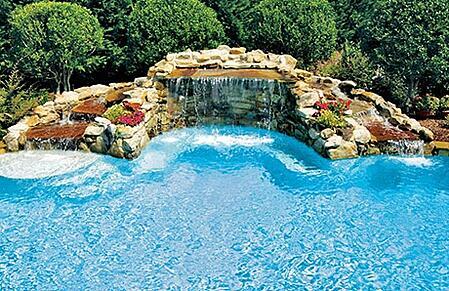 You can up the ante on your waterfall design with a grotto. A real backyard pleaser, a grotto is a rock waterfall with a covered area beneath it that’s large enough for a few people to enjoy together. You can outfit a grotto with seating or lighting, and use it as a spot for playing or relaxing in the shade. 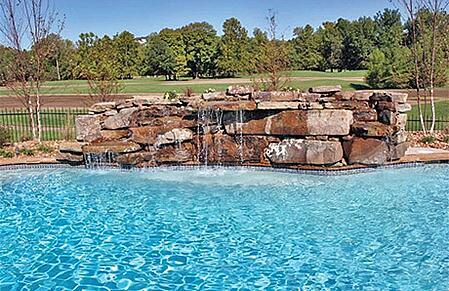 A custom rock waterfall can be showstopper during the day, so wouldn’t you like to be able to enjoy it at night too? With the advent of efficient, long-lasting LED (light-emitting diodes) lighting, it’s easier than ever to beautifully illuminate your creation for evening viewing. While the regular light in your pool may cast of some illumination onto the waterfall, it’s just not the same as having small, individual LED spotlights providing targeted lighting. Small LEDs can illuminate each tier or major niche in the rock configuration, as well as the spills of flowing water coming down the waterfall. Better yet, these advanced systems deliver a range of dazzling changing colors—turning your waterfall into an awesome nighttime attraction! With their tiers, crevices, various shapes, and organic-style configurations, rock waterfalls can do a great job capturing the light. Here, dazzling multi-color LED lighting system creates an intense rainbow around this creation. The visual benefit that stems from integrating a waterfall into your backyard swimming pool comes with a payoff for your ears as well: Many homeowners love the soothing sound of cascading water as it falls onto the pool surface below. Indeed, an afternoon relaxing on a lounge chair under a deck umbrella becomes even more tranquil when accompanied by the auditory backdrop of gently falling water. Of course, background sounds that are overpowering are counterproductive to creating a peaceful setting. Too much water gushing over the waterfall can be downright annoying. That’s why the equipment that powers your waterfall—and how your pool builder configures it—can make a difference. Your builder will determine the best size of the pump and an appropriate plumbing arrangement to generate the right amount of water flow and accompanying sound level. Encompassing about a third of the pool perimeter, this 30-foot-wide project incorporates the spa spillway, making it appear even wider. The waterfall has a level trough that runs the length, and it’s powered by its own 2-horsepower pump. Is your backyard especially quiet? Will the waterfall be positioned near your home—particularly near a window that’s often open? If so, tell your builder to design and power the waterfall for a softer sound, so it’s not overwhelming. On the other hand, if you live in a noisy area where traffic or other sounds might drown out the waterfall sounds, or if the waterfall is situated far from your residence, go another route. 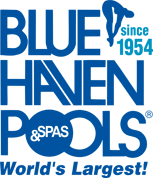 Ask for a design with a high water drop, in which the drop-off point is set high above the pool; this way, the water travels further and will hit the pool surface with greater force—making a bigger sound to enjoy. For the quiet backyard and position close to this house, this waterfall of weathered fieldstone boulders is a smart choice: A set of very low two- and three-tier falls drop down only a couple of inches before hitting the pool surface—providing the clients the soft, soothing sound they desired. 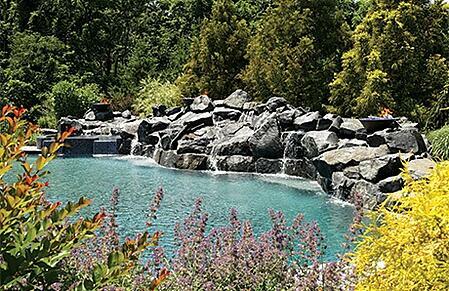 Plan to incorporate a natural rock waterfall into the overall design and budget of your new outdoor oasis. You’ll come away with an attractive, original creation unlike any other. 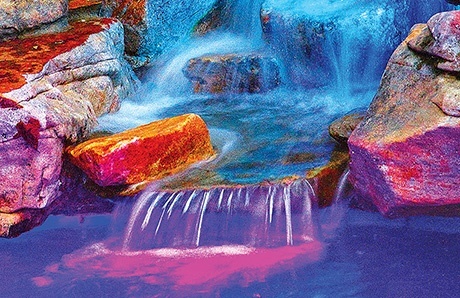 And with the addition of a jump rock, plant pockets, accent boulders, accent lighting to illuminate the waterfall, and anything else you and your pool designer dream up, your eyes and ears will be treated to a lovely, calming mix of sights and sounds. With various shapes and cuts of moss rock, this commanding tower of rocks stands 16 feet over the swimming pool, dropping a wide veil of water over a large pool bench below. Two smaller multi-tier falls with darker, contrasting stone flank the main structure.